I would leave it as it is, do not paint or varnish. That works too Thomas. It will gain a natural colour anyway. Forget about the door. It is still only a shed! My room as a kid, the one in which my first model railroad layout was, my father had paneled with just such panels. Even without painting or glaze. Thanks to everyone for your thoughts regarding the finish of my timber cladding. The consensus appears to be leave it as it is and so I'm in agreement with that as it will save me additional work. I haven't totally ruled out painting the roof white in order to reflect some light back down but I'll see how it goes - it does seem bright enough with the two lights. 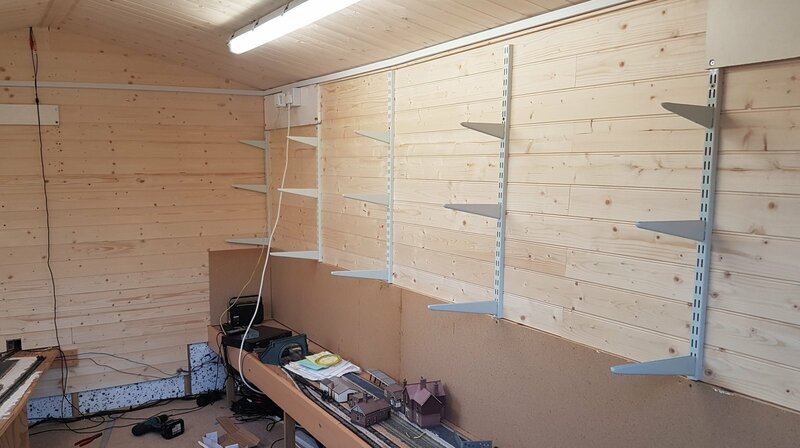 I've fastened the shelf bracket uprights to the rear wall of the shed but as yet I haven't got any suitable timber boards for the shelves. I've slotted brackets in place but I'm not sure exactly where they'll be going just yet. Once again I've run out of cladding, as you've probably noticed, and there's just a few sections needed to complete the lower part on the non-door end wall. Plastic conduit in place to take electrical cables and once the shelves are installed I'll be able to get rid of the trailing wires and cables too so we're getting there. Once the lower shelf is installed it's going to shield a lot of light from the terminus section but I have a 5 metre LED strip that will fit under the shelf so I'll give that a try. Having done some things with wood and really liked the raw wood look, I can say that it will yellow. SO a varnish or some such, like clear varnish, would keep it nice and pale. The room looks great BTW. My shed is a disaster zone. Well here's a view that hasn't been seen for some time - Shieling Bridge station almost completely devoid of rolling stock and infrastructure! I've done a bit of weatherproofing on the outside of the shed and just had a general tidy round inside so thought I'd grab a photo of the empty station. It shows just how much work I still have to do but at least now it's a much more comfortable environment in which to do it. By the time I'm back up and running there's unlikely to be many opportunities to run anything round the garden but at least if it's cold or wet outside, I should be able to make myself comfy in the shed and get on with finishing the stations. I've not yet got round to altering the far left hand siding which scrapes against the cladding and I've still to repair the damage to my colour light signal, which currently lies on the platform, after it's unfortunate trip up the vacuum cleaner nozzle. I like these elegant track layouts in your station, everything is flowing harmoniously and not so aligned with the track geometry of a manufacturer. This is also the advantage of the "inside and outside" layout, you just have to create the space. Meanwhile I also consider an outdoor station. Garden railways require frequent repair and maintenance and this morning I've been out trying to put this back together. Perhaps it was the Sparrowhawk or maybe the pigeons perching on it? It's only damaged along one side so it doesn't feel like a cat that's jumped over as I would have expected it to have damaged both sides. Since I reported on the damage to Stack Gill viaduct, and after having repaired it, I discovered a few days later that it had been damaged again. I now believe it's a cat that's causing the damage and so I've nailed some security spikes along the top of the boundary fence where it seems it's jumping over and down onto the top of the viaduct. It appears to have worked so far. I've not finished work inside the shed so nothing has been replaced and thus there's nothing new to report, however, I have managed to get hold of some new Bachmann MK2F coaches which I'm looking to forward to seeing on track. I've also ordered a Mk2F DBSO which, as far as I'm aware, I've never seen in operation in real life but which appear to offer me a way of running back and forth between the two stations without the need to remove the loco in the terminus station and stick it back on the other end. I'm probably going to be operating a model railway with vehicles and liveries that might never have been seen together at the same time but that's the way I enjoy it. I hope kitty wasn't hurt too badly. I have a soft spot for animals. We used to have the neighbors cat on its wonder around the neighborhood climb up over our double gate and jump onto the rubbish bin onto the air-con making a noise early hours of the morning, found him lying on the layout. He is getting on in years don't see him much only likes to lie in the front garden now. You will probably need to put those spikes all the way along the fence, could try bard wire, he will find a way to jump over your fence. I wish I kept a pic of a Cockatoo , he used to come and sit on the layout , he had a go the track, no damage. Good the Kitty has found a new place to jump over your fence and not on the bridge, cat owners should keep their cats locked up in their own yard. Have you fixed the bridge now Mick. It's been very quiet again on Worsley Dale but there's been a fair increase in rolling stock, many of which will be featured on the layout in the coming months. 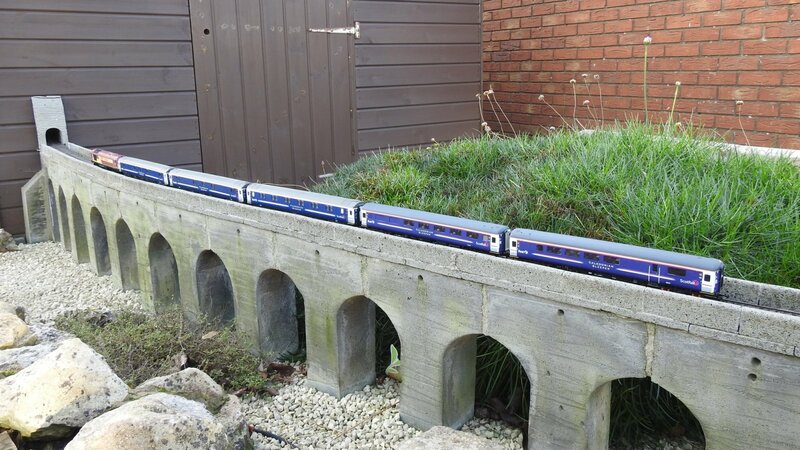 I've been reading up on the Scottish railway scene lately and devouring lots of photographs and although it was mentioned by someone when work initially began on Worsley Dale, I never really took to the idea of modelling the Caledonian Sleeper because I just thought of a long rake of coaches running from London to Edinburgh that would look totally out of place on my little single line railway. But I hadn't really seen the opportunity that it presented upon arrival in Edinburgh and its forward movements with varying numbers of coaches and array of motive power. The trouble with modelling the Caledonian Sleeper is that it can be very expensive. The MK3 sleeper coaches are in great demand and command a correspondingly high price while there are no commercially available models of the day coaches. In model form, much like in real life, the RLO and BUO day coaches must be converted from other MK2 coaches and while there are some examples occasionally listed on eBay the quality of workmanship isn't always that great. I was lucky to drop on a pair that I'm quite happy with. The correct day coaches are not absolutely necessary however as there is plenty of photographic evidence to show that even when the train was in First Scotrail Caledonian Sleeper livery (as on the accompanying photos here) there could often be seen standard MK2 coaches in InterCity Executive livery for example. I intend to recreate some of those images at some point and have obtained the correct coaches in order to do so. I'm not sure why but to me the class 67 looks like it was made for hauling the sleepers through the Highlands. Below is 67024 in EWS livery hauling three MK3 sleepers and the two day coaches over Low Shott viaduct. The class 67's are being replaced by class 73's for the Highland sleepers but not before 67004 (below) was repainted in Caledonian Sleeper livery. This is 67004 'CAIRN GORM', a Hornby model fitted with TTS sound. Double heading is not uncommon on the sleeper service and so as I had both locomotives out on a cold day down in Worsley Dale I decided to put them together for another photo with 67024 leading 67004. And after what, five years or so, just look at how Low Shott viaduct has weathered and withstood a number of harsh winters without any undue damage. I would really like to recreate the sleeper service with InterCity liveried sleepers but I've yet to see any offered anywhere and I dread to think of what the asking price would be. 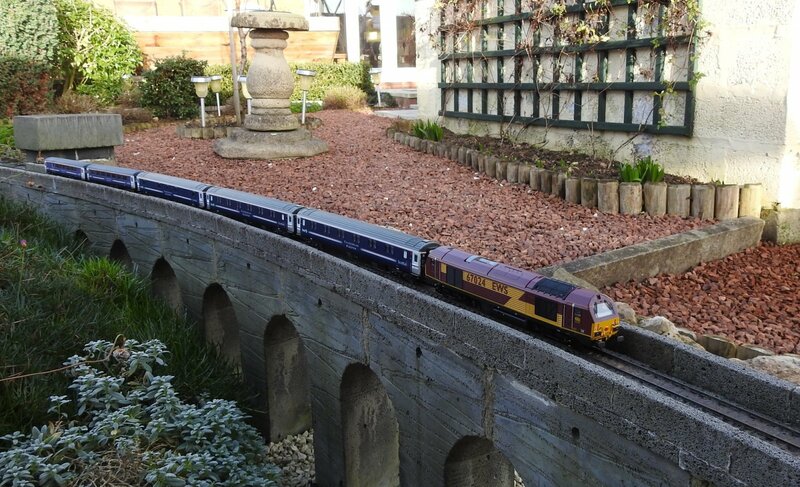 I might have to console myself by modelling the Scotrail HST's just announced as part of the Hornby 2019 range. Lovely Mick. I think the last time I went between London and Edinburgh on a night train, it was steam hauled. 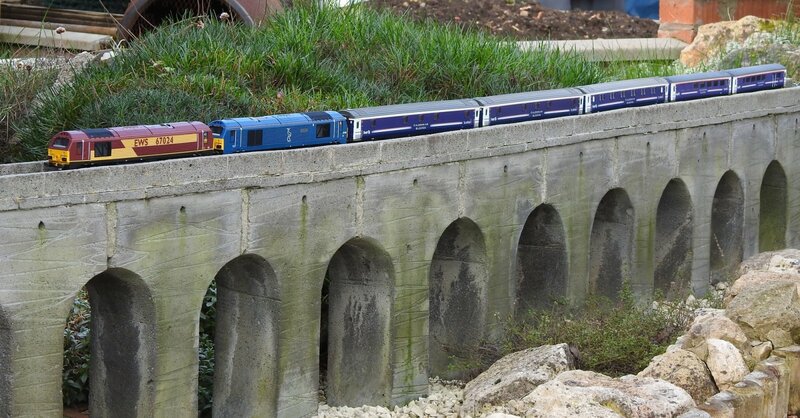 That viaduct is certainly weathering well too. Happy new year 2019 mick and Roddy, nice train , the 67 replaced the 66 class, nice looking loco, I like dual cab diesel locos, no need for a turn table, sadly over here we only have single cab diesel locos and they double head, I would like to at least have one Irish train, they have an over night train as well. Mick have you finished lining the inside walls of your shed . What's the weather over there, low 30's here. Photos look really good, Mick. As Roddy says, the viaduct weathering is very effective - looks to be more of it on one side than the other, which I guess is quite authentic. Firstly a rather belated Happy New Year to everyone as well as my most sincere apologies for my very late 'thank you' to Andrew for the 2019 Dorking Garden Railway calendar. We have been busy closing down our caravan for the winter period but now have several free weeks during which I hope to make use of my insulated shed along with my little heater in order to get the layout put back together in readiness for running to recommence. You won't be surprised to learn that it's all very much as it was and I'm sure you've come to expect nothing more from me. I do tend to work in little spurts as you know but even when you have few commitments there still never seems to be enough time and opportunity to do the things you want to do. Anyway, in answer to some questions no Tony, I still have that small bit of shed wall that I never completely finished lining but it's no big deal and won't take long to remedy. I also still have some electric cable that needs enclosing in plastic trunking to tidy it all up. Again not a long job once I get started. The weather's pretty mild here at the moment but it's forecast to get cooler by the middle of next week so it might prove the first test of the shed insulation. The class 67 didn't replace the class 66 - it's just a smaller Bo-Bo version introduced for passenger type work whereas the class 66 Co-Co was intended for heavy freight workings. Roddy I would love to recreate the steam day sleeper too but my current 'Scottish themed' modelling period already extends from the 1980s to present day and the necessary stock costs a small fortune. On top of that Hornby go and announce even more Scottish liveried models for the coming year and I'm really tempted. Andrew, thanks for the Calendar as already mentioned. Yes, the weathering on the viaduct is certainly more effective on the sheltered side. We normally get rain from the west and the weathered side faces north-east so little rain and sunshine mainly during the summer months. 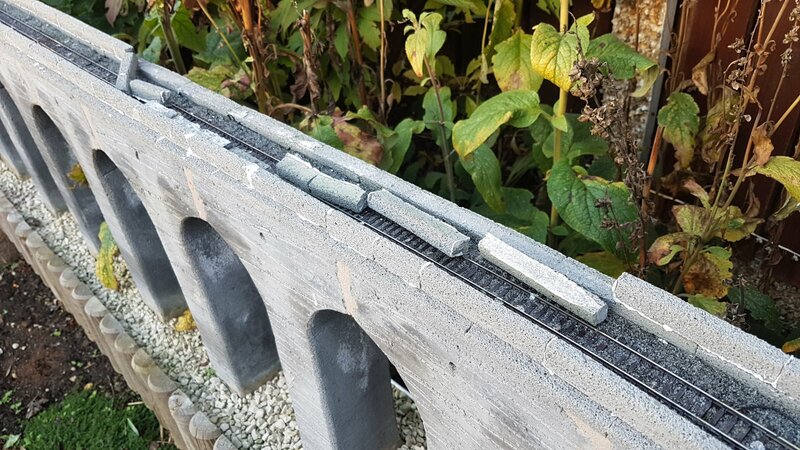 The long term perseverence required to do a Garden railway build has really paid off on your layout. It looks really wonderful. And the added bonus of wild life and cat life is nice to see too. Can;t say I've had that same kind of railway progress myself. Still sitting indoors, looking at snow outside, and contemplating my next layout. 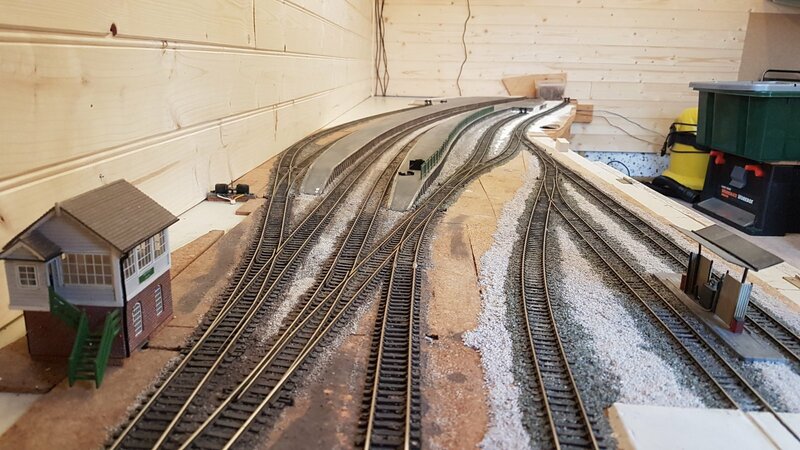 Yes Griff, for the main part the layout has stood up well to the elements over the past seven years almost. I'm going to need to replace some of the ground level boards this year but that was planned anyway. The viaducts have been almost problem free other than a few of the top parapet walls becoming dislodged due to enthusiastic children and a local feline (which appears to have . The snow hasn't reached us yet although a cold spell is around the corner, but at least the days have started lengthening which is always welcome. Firstly a rather belated Happy New Year to everyone as well as my most sincere apologies for my very late 'thank you' to Andrew for the 2019 Dorking Garden Railway calendar. You're very welcome. I sent you that as a small Thank You for all the work you do throughout the year to keep this great website available. Although we the users don't often say thank you, I'm sure we are all extremely grateful to you for keeping this community facility available for our general enjoyment - along with the many people who just come to look without choosing to post. Many thanks once again.